In the first part I spoke about how to build our working environment to work with UI5 locally instead of using WebIDE. Now, in this second part of the post, we’ll see how to do it using docker to set up our environment. I’ll use docker-compose to set up the project. Basically, as I explain in the first part, the project has two parts. One backend and one frontned. We’re going to use exactly the same code for the frontend and for the backend. In docker-compose we only need to map the port that we´ll expose in our host and since we want this project in our depelopemet process, we also will map the volume to avoid to re-generate our container each time we change the code. The backend is a PHP application. We can set up a PHP application using different architectures. In this project we’ll use nginx and PHP-FPM. RUN composer global require "laravel/lumen-installer"
With this configuration we’re exposing two ports 8080 for the frontend and 8000 for the backend. We also are mapping our local filesystem to containers to avoid to regenerate our containers each time we change the code. We also can have a variation. A “production” version of our docker-compose file. I put production between quotation marks because normally we aren’t going to use localneo as a production server (please don’t do it). We’ll use SCP to host the frontend. When I work with SAPUI5 projects I normally use WebIDE. WebIDE is a great tool but I’m more confortable working locally with my local IDE. I’ve this idea in my mind but I never find the time slot to work on it. Finally, after finding this project from Holger Schäfer in github, I realized how easy it’s and I started to work with this project and adapt it to my needs. The base of this project is localneo. Localneo starts a http server based on neo-app.json file. That means we’re going to use the same configuration than we’ve in production (in SCP). Of course we’ll need destinations. We only need one extra file called destination.json where we’ll set up our destinations (it creates one http proxy, nothing else). In this project I’ll create a simple example application that works with one API server. Basically it has two routes. In fact both routes are the same. One accept POST request and another one GET requests. Both routes are under one middleware to provide the authentication. That means our service will need Basic Authentication and also one Token based authentication. Now we’ll create our extra file called destinations.json. Localneo will use this file to create a web server to serve our frontend locally (using the destination). When we click on GET we’ll perform a GET request to the backend and we’ll increment the counter. The same with POST. We’ll also show de date provided by the backend in a MessageToast. As we’re working locally we can use local debugger in the backend and we can use breakpoints, inspect variables, etc. We also can debug the frontend using Chrome developer tools. We can also map our local filesystem in the browser and we can save files directly in Chrome. We also can test the frontend using OPA5. Basically we need to download MTA Archive builder and extract it to ./ci/tools/mta.jar. This days I’m involve with Amazon’s AWS and since I am migrating my backends to Lumen I’m going to play a little bit with AWS and Lumen. Today I want to create a simple Lumen server to handle SNS notifications. One end-point to listen to SNS and another one to emit notifications. I also want to register logs within CloudWatch. Let’s start. As we can see there’s a route to push notifications and another one to read messages. Debugging those kind of webhooks with a EC2 instance sometimes is a bit hard. But we can easily expose our local webserver to internet with ngrok. And that’s up. Lumen and SNS up and running. Today I want to create an UI5/OpenUI5 boilerplate that plays with Lumen backends. Simple, isn’t it? We only need to create a Lumen API server and connect our OpenUI5 application with this API server. But today I also want to create a Login also. The typical user/password input form. I don’t want to build it from scratch (a user database, oauth provider or something like that). Since this days I’m involved with Amazon AWS projects I want to try Amazon Cognito. Let’s start with the OpenUI5 application. I’ve created an small application with one route called “home”. To handle the login process I will work in Component.js init function. The idea is check the cognito session. If there’s an active one (that’s means a Json Web Token stored in the local storage) we’ll display to “home” route and if there isn’t we’ll show login one. To encapsulate the cognito operations I’ve create a model called cognito.js. 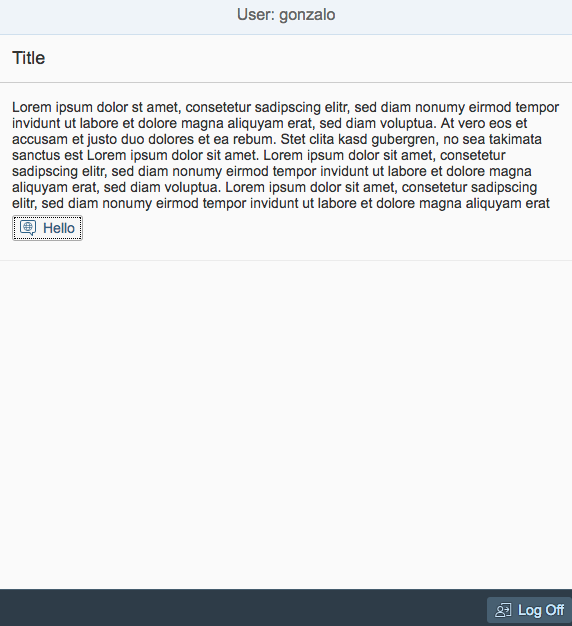 It’s not perfect, but it allows me to abstract cognito stuff in the OpenUI5 application. “login” is the main one. 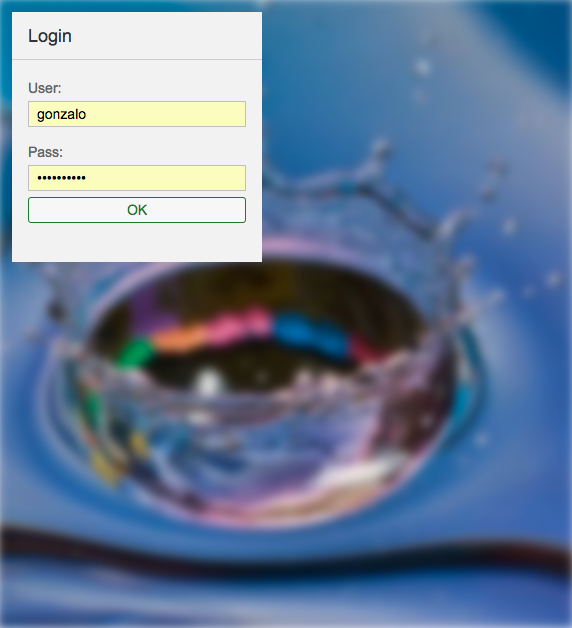 In this stage the user can input his login credentials. If credentials are OK then we’ll display home route. The home route is the main one. It asumes that there’s an active Cognito session enabled. It shows the Cognito login name. It alos has a simple logff button and also one button that calls to the backend. To handle ajax requests I’ve create an api model. This model injects jwt inside every request. That’s the frontend. Now it’s time to backend. Our Backend will be a simple Lumen server. As you can see I’ve created a middelware to handle the authentication. This middleware will check the jwt provided by the frontend. We will use “spomky-labs/jose” library to validate the token. Today I want to play with an experiment. When I work with mobile applications, I normally use ionic and on-premise backends. Today I want play with cloud based backends. In this small experiment I want to use an ionic2 application to take pictures and upload them to an S3 bucket. Let’s start. First I’ve created a simple ionic2 application. It’s a very simple application. Only one page with a button to trigger the device’s camera. The controller uses @ionic-native/camera to take photos and later we use @ionic-native/transfer to upload them to the backend. I just wanted a simple prototype (a working one). Enough for a Sunday morning hacking. I had this post ready weeks ago but something has changed. Silex is dead. So, as an exercise I’ll migrate current Silex application to Lumen (a quick prototype). Probably we can find a S3 Service provider, but I’ve built a simple one for this example. The last week was deSymfony conference in Castellón (Spain). IMHO deSymfony is the best conference I’ve ever attended. The talks are good but from time to now I appreciate this kind of events not because of them. I like to go to events because of people, the coffee breaks and the community (and in deSymfony is brilliant at this point). This year I cannot join to the conference. It was a pity. A lot of good friends there. So I only can follow the buzz in Twitter, read the published slides (thanks Raul) and wait for the talk videos in youtube. In my Twitter timeline especially two tweets get my attention. One tweet was from Julieta Cuadrado and another one from Asier Marqués. Javier recommends us not to use Silex in future new projects and mark existing ones as “legacy”. It’s hard to me. If you have ever read my blog you will notice that I’m a big fan of Silex. Each time I need a backend, a API/REST server of something like that the first thing I do is “composer require silex/silex”. I know that Silex has limitations. It’s built on top of Pimple dependency injection container and Pimple is really awful, but this microframework gives to me exactly what I need. It’s small, simple, fast enough and really easy to adapt to my needs. I remember a dinner in deSymfony years ago speaking with Javier in Barcelona. He was trying to “convince” me to use Symfony full stack framework instead of Silex. He almost succeeded, but I didn’t like Symfony full stack. Too complicated for me. A lot interesting things but a lot of them I don’t really need. I don’t like Symfony full stack framework, but I love Symfony. For me it’s great because of its components. They’re independent pieces of code that I can use to fit exactly to my needs instead of using a full-stack framework. I’ve learn a lot SOLID reading and hacking with Symfony components. I’m not saying that full stack frameworks are bad. I only say that they’re not for me. If I’m forced to use them I will do it, but if I can choose, I definitely choose a micro framework, even for medium an big projects. New version of Symfony (Symfony 4) is coming next November and reading the slides of Javier at slideshare I can get an idea of its roadmap. My summary is clear: “Brilliant”. It looks like the people of Symfony listen to my needs and change all the framework to adapt it to me. After understand the roadmap I think that I need to change to title of the post (Initially it was only “Silex is dead”). 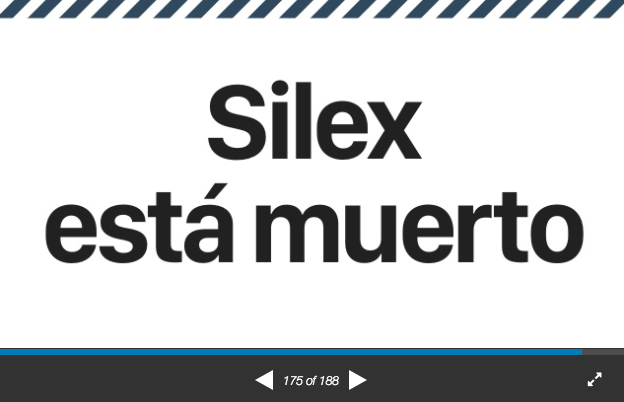 Silex is not dead. For me Symfony (the full stack framework) is the death. Silex will be upgraded and will be renamed to Symfony (I know that this assertion is subjective. It’s just my point of view). So the bad feeling that I felt when I read Julieta and Asier’s tweets turns into a good one. Good move SensioLabs! But I’ve got a problem right now. What can I do if I need to start a new project today? Symfony 4 isn’t ready yet. Javier said that we can use Symfony Flex and create new projects with Symfony 3 with the look and feel of Symfony 4, but Flex is still in alpha and I don’t want to play with alpha tools in production. Especially in the backend. I’m getting older, I know. For me the backend is a commodity right now. I need the backend to serve JSON mainly. I normally use PHP and Silex here only because I’m very confortable with it. In the projects, business people doesn’t care about technologies and frameworks. It’s our job (or our problem depending on how to read it). And don’t forget one thing: Developers are part of business, so in one part of my mind I don’t care about frameworks also. I care about making things done, maximising the potential of technology and driving innovation to customer benefits (good lapidary phrase, isn’t it?). So I’ve started looking for alternatives. My objective here is clear: I want to find a framework to do the things that I usually do with Silex. Nothing more. And there’s something important here: The tool must be easy to learn. I want to master (or at least become productive) the tool in a couple of days maximum. I started with the first one: Lumen and I think I will stop searching. Lumen is the micro framework of Laravel. Probably in the PHP world now there’re two major communities: Symfony and Laravel. Maybe if we’re strict Laravel and Symfony are not different communities. In fact Laravel and Symfony shares a lot of components. So maybe both communities are the same. I’ve almost never played with Laravel and it’s time to study it a little bit. Time ago I used Eloquent ORM but since I hate ORMs I always return to PDO/DBAL. As I said before I didn’t like Symfony full stack framework. It’s too complex for me, and Laravel is the same. When I started with PHP (in the early 2000) there weren’t any framework. I remember me reading books of Java and J2EE. Trying to understand something in its nightmare of acronyms, XMLs configurations and trying to build my own framework in PHP. Now in 2017 to build our own framework in PHP is good learning point but use it with real projects is ridiculous. As someone said before (I don’t remember who) “Everybody must build his own framework, and never use it at all“. If you’re a Silex user you only need a couple of hours reading the Lumen docs and you will be able to set up a new project without any problem. Concepts are the same, slight differences and even cool things such as groups and middlewares. Nothing impossible to do with Silex, indeed, but with a very smart and simple interface. If I need to create a new project right now I will use Lumen without any doubt.